Prime Minister Narendra Modi is aiming at mobilising support from the general public for the upcoming Lok Sabha election. PM Modi interacts with volunteers, supporters well wishers, spread from across the country. 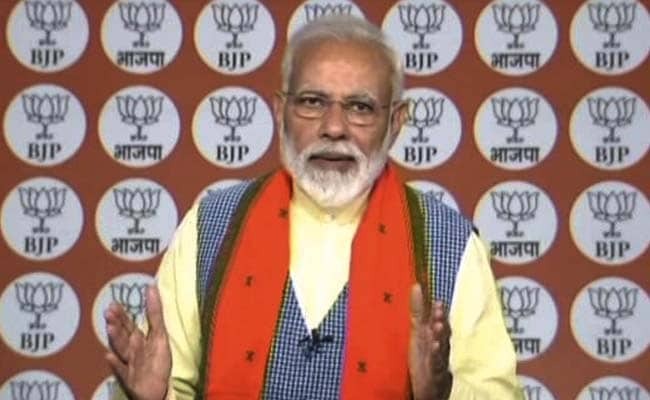 As part of the 'Mera Booth Sabse Mazboot' programme, Prime Minister Narendra Modi interacts with 1 crore Bharatiya Janata Party (BJP) workers and volunteers from 15,000 locations across the country.The party has claimed that this is the"world's largest video conference". The BJP chief Amit Shah and other party leaders participated in the programme from its Delhi office. Opposition parties like the Congress and the Aam Aadmi Party have slammed the BJP and the Prime Minister Narendra Modi for going ahead with the event at a time when an Indian Air Force pilot has been captured by Pakistan after an air combat near the Line of Control on Wednesday marked the worst escalation of conflict between the two nuclear-powered neighbours in decades. With the interaction, PM Modi is aiming at mobilising support from the general public and galvanising the party workers into action for the upcoming Lok Sabha election. PM Modi is interacting with volunteers, supporters and party karyakartas from across the country," Prime Minister's website tweeted. "Every citizen in the country right now wants to contribute in some way or the other towards India's betterment. Every Indian has an unshakable belief on himself as well as the government, and that is our biggest achievement," says PM Modi while addressing BJP workers during 'Mera Booth Sabse Mazboot' programme. My advice to all BJP booth workers is to reach out to supporters and others in your area and explain the good work done. There should be a healthy competition between booth workers across the country. They should be motivated to meet as many people. They should compete to see who gets the maximum number of new voters, or young voters, or women voters to come out and vote during the elections. "Booth soldiers need to step up now. If you win your booth, if you win hearts of people, you can work directly for the nation," says PM Modi. Whatever is your duty... whatever is your work... do your bit. Work extra, work harder to take India to greater heights. India will stand as one, India will work as one, India will grow as one, India will fight as one, India will win as one. Today, the youth in India are determined to take India to new heights... to do something for our country, to work for the progress of our country.... Today, India is at a juncture, from where success is within our reach... greatness is within our sight. All we have have to ensure is that we do our work sincerely and contribute our bit for the country's progress. When the enemy supports terror and carries out activity against India, it is with the intent that India's progress gets stalled. But we must all ensure that we stand together, stand united, stand with our soldiers to ensure we are strong... ensure that no matter what, our progress and our work does not stop. Prime Minister Narendra Modi is addressing BJP workers, says nation stands with jawans. Amid heightened tension between India and Pakistan, the PM said that India won't stop at any cost. He made the statement while addressing BJP workers during "world's largest videoconference" 'Mera Booth Sabse Mazboot'. The BJP has said that one can send your question through NaMo app to the Prime Minister or using #MeraBoothSabseMazboot on social media. Before PM Modi could address the party workers, Twitter has been flooded with comments from opposition leaders demanding him to cancel the event. BSP supremo Mayawati has lashed out at Prime Minister Narendra Modi over his video conference. In a tweet, she said that PM Modi should worry about the nation's security first but he is busy with his party affairs. I would urge the PM to postpone this. At this moment, we as a nation, need to spend all our energies and time to get the IAF pilot back safely and to sternly deal with Pak, Delhi chief minister Arvind Kejriwal tweeted. Congress spokesperson Randeep Surjewala tweeted saying, "Glaring case of misplaced priorities! 132 Cr Indians pray for safe & immediate return of India's brave-heart Wing Comm, Abhinandan but Modiji desperate only for re-election. Congress cancelled its imp CWC & Rally today. Pradhan Sevak hell-bent on creating a Video Conf. record"
In this time of strife when BJP has asked the nation to be United, they are still shamelessly running their election campaigns, tweeted Senior Congress leader Abhishek Singhvi. Prime Minister Narendra Modi will interact with 1 crore Bharatiya Janata Party (BJP) workers and volunteers from 15,000 locations across the country today.